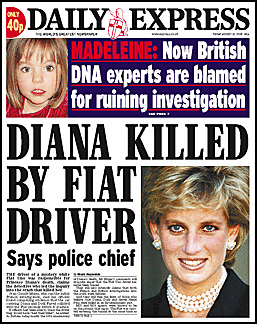 There used to be an ongoing joke that you knew it was Monday because the Daily Express had a Diana Exclusive on the front page. Then I started to notice that almost every day was Diana day, so I thought about writing a script to cache the front page and then comeback months later and check. So the fruits of my code is this: Daily Diana Express. It goes back to the start of March and has every front cover. A quick scan of all the thumbnails and I have counted that 34 / 178 covers featured Diana, another 20 had the royals (Harry / Will / Kate / Charles / Camilla / Ann), but more suprising and featured in this fortnights Private Eye was that 70 out of 118 (59%) papers since the 5th May have Madeleine McCann on the front page. So maybe its time to stop calling the paper The Daily Diana Express and instead The Daily Maddy Express?